I received this beautiful fall arrangement at our Kiwanis installation and they’re still going strong nearly two weeks later. Speaking of going strong – it’s a long weekend and I’ll be going strong with baby visiting all weekend! Hope you’re doing something equally wonderful! Gorgeous flowers. No doubt they will be over shadowed by human cuteness. Enjoy! 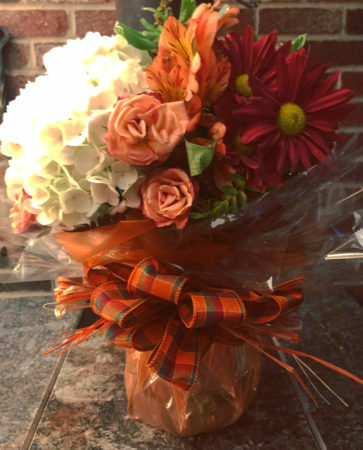 Lovely fall flowers and even lovelier is the intersection of a long weekend with a newborn that needs snuggling. Maybe you’ll even have time for some baby knitting (quick, before he starts growing out of things)! Very pretty flowers. Enjoy the baby visiting and cuddling. Beautiful flowers! I am green with envy – baby snuggling! Nothing smells better than new DNA! The flowers are amazingly strong. I loved seeing the pictures of baby Jack and you all!